Self-organized Internet users are gathering at Verizon stores and Congressional offices in more than 700 cities throughout the day today demanding that Congress take action to #StopTheFCC vote planned on December 14 to gut net neutrality protections. Dozens of protests have already happened while many more are planned for this evening. The protests are part of growing backlash to the FCC’s plan from across the political spectrum, which has generated more than 800,000 phone calls to lawmakers through the site BattleForTheNet.com alone. 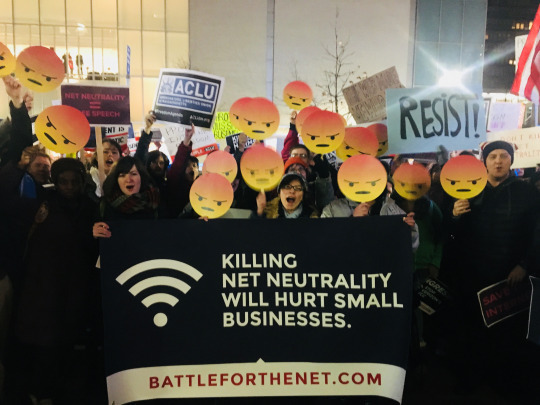 On the heels of today’s ground protests, net neutrality supporters are calling on Internet users, websites, apps, and small businesses to participate in “Break the Internet,” an online protest starting 48 hours before the FCC’s scheduled vote, where sites, apps, and social media feeds will appear creatively “broken” as they might be without net neutrality protections, with messages driving phone calls to Congress. Twitter users will “break” their feeds by using a #BreakTheInternet tool that will auto-tweet about net neutrality every 10 minutes starting on December 12 until the FCC votes. The protests today are supported by Team Internet, a grassroots network of nearly half a million volunteer activists spearheaded by Demand Progress, Fight for the Future, and Free Press Action Fund. The groups allowed volunteers to “host” protests and added them to a map, using text messaging and email to help local hosts recruit participants in their area. Protesters are demanding that their members of Congress publicly call on the FCC to cancel their vote on December 14. The FCC’s plan contains an unprecedented and total repeal of net neutrality protections, posing a grave threat to the future of freedom of expression, access to information, and small businesses particularly for communities of color and low income communities. Over recent months the groups behind the protests have organized thousands of constituents to attend more than 600 town halls and meetings with lawmakers to demand their support for net neutrality.